I’m behind on emails, replies to blog comments, visiting other blogs, Facebook, Twitter – you name it. This post was also tossed together pretty quickly because I had to buy groceries and do laundry to get youngest son ready to leave today for his second European tour. But I digress. As I mentioned on Friday, all of it was for a good reason – we took a long weekend trip to NYC! I hadn’t been in over 20 years, and was so excited to return. The primary reason for going this time was the youngest son. He’s a music major, and I kid you not, he fell in love with Phantom of the Opera music and the movie when he was in kindergarten. When he asked to watch it at the age of 5, I explained it wasn’t a Scooby-Doo-type of phantom. He rolled his eyes and replied he already knew that (I’m telling you, this kid was born an old soul). Guess we should have known even then his path would lead toward music. 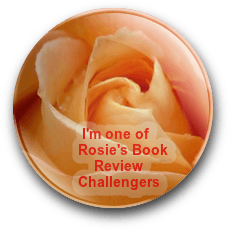 Anyway – on with the activities and pictures. Youngest son had absolutely no interest in doing the regular touristy things. 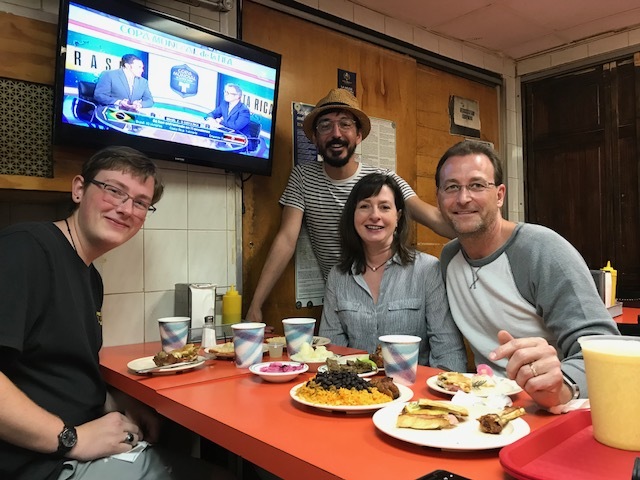 As a foodie, he researched food tours and chose a fantastic one – No Passport Required, by In Food We Trust. We sampled authentic flavors from Turkey, India, Japan, Israel, Cuba, and Italy. I realized I’d found my purpose in life upon my first bite of chocolate babka – flaky, delicious heaven laced with chocolate. Our fabulous tour guide was Angelis Nannos, wearing the hat in the pic above. He was such fun, and his knowledge of food and its history was quite impressive. We made a new friend that day. Mostly at hubby’s urging we went to the top of Rockefeller Center – the pic of the Empire State Building above was taken from there. 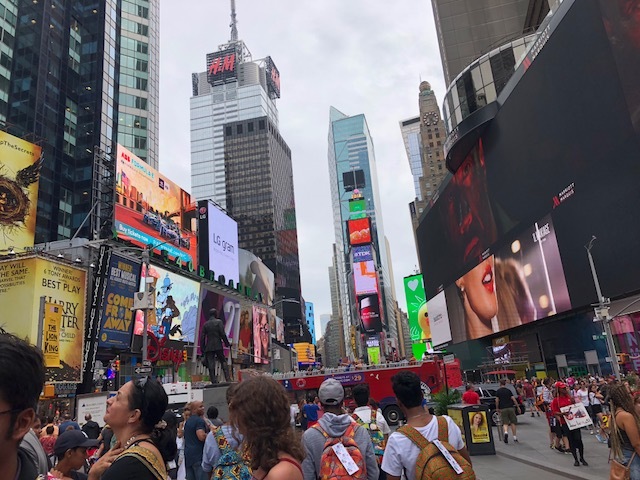 Our hotel was perfectly situated in Times Square, where we walked to the Book of Mormon show on Thursday night. With our room being on the 46th floor, do I really need to tell you how beautiful the view was at night? On Saturday, foodie son wanted to visit Little Italy and Chinatown, where we drooled over all the fresh seafood, produce, and Italian delis. Lunch was at an Italian bistro – I’m convinced I was Italian in a previous life. 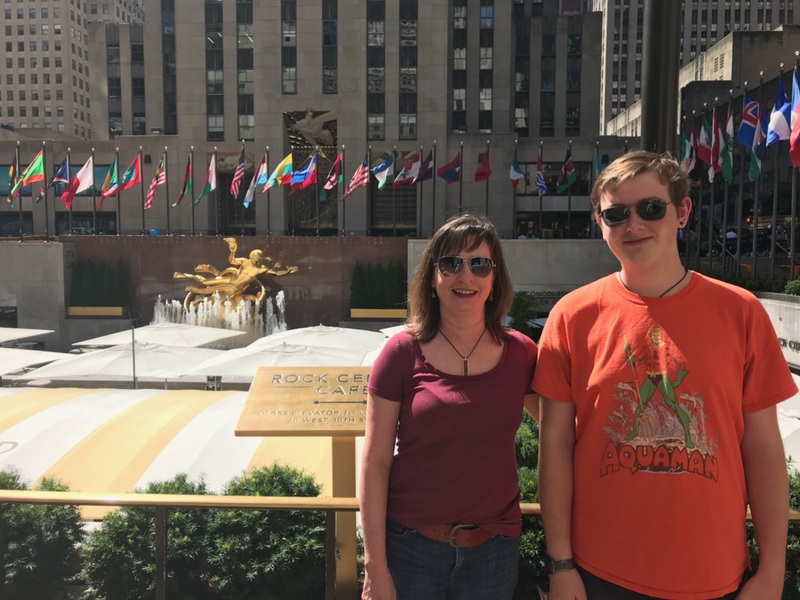 We then traveled to Central Park, and if you hear about some crazy tourist family having a standoff in the middle of a subway station arguing about how to get to their destination – yeah, that was us. Saturday night was pretty touristy. Dinner was at Sardi’s – and we were soooo lucky to get in with no reservation – then on to Phantom of the Opera, where we had fantastic seats. I’d already seen it on Broadway twice, but seeing it with my son was priceless. He said it was the first time music gave him chills. During intermission, he was able to go up to the stage and see the orchestra below – to a music major, this was a rare treat. He was fascinated by all the instruments and equipment packed into such a small space. 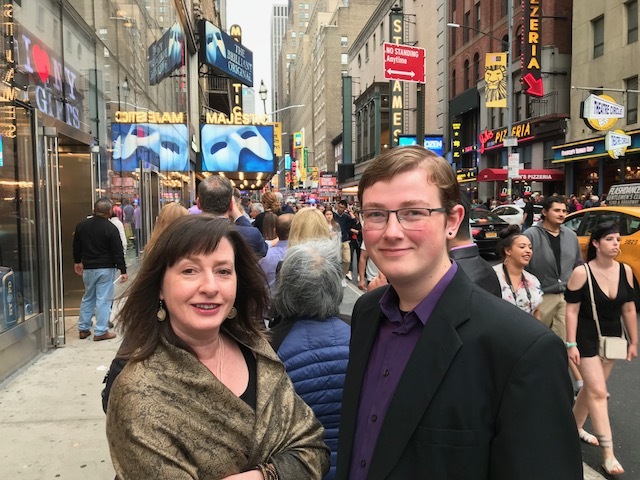 It was a rushed, busy, fun-filled weekend, but we were thrilled to experience NYC again through my son’s eyes before he leaves today for three weeks – to visit Switzerland, Germany, Italy, Spain, Lichtenstein, and France on a music tour. This kid’s having one hell of a summer! I think it’s fabulous your son is going to experience all those places! And what fun you must have had in New York. The photos are awesome and your trip sounds amazing. Your son must be extremely talented. I also can’t believe he fell in love with the Phantom of the Opera that young. Wow! We really had a blast, Mae. So much fun to experience it with my son. It astounded me how much he loved the music at such a young age. He’s very fortunate to travel to these countries – but he also spends countless hours in the practice studio. He’s pretty disciplined – at least when it comes to his music! 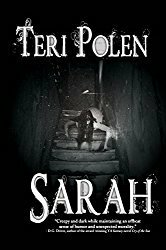 What a wonderful weekend, Teri. I love NYC. I lived in Connecticut for four years and got to The City once a week. I am envious of the sights, sounds, and smells. Your son is rockin’ the summer for sure. I’d forgotten how much I loved it, John! I envy you for being able to visit so often when you lived that close. It was a special time of my life. I also had an apartment at 57th and 9th. That’s awesome! What an amazing trip—the sights, the views, the show! I saw Phantom (in Pittsburgh) and it was the most impressive performance I’d ever seen. (And I’ve gone to a lot of performances.) Never saw a show on Broadway, though. What an experience! Wishing your son save travels and you a quick catch-up! Such incredibly talented performers no matter where you see it, Staci – those voices! I don’t even sing in church. Hoping for time to somehow stretch and allow me to catch up today. Sounds like a fantastic weekend. Hope your son enjoys his trip… Awesome he’s getting to do all that travelling! It really was, Tori. I’m sure he’ll enjoy his trip – besides performing, he also has several friends going. Just an incredible opportunity. Sounds like a great time. I probably would have preferred Book of Mormon, but something on Broadway has to be wonderful. That last photo looks like a pro took it. Love the motion behind you and all the activity it suggests. That pro would be hubby – who usually cuts off everyone’s head. He lucked out this time. And there was definitely a lot of motion – especially at Frozen across the street. The line went one farther than I could see. Sounds like a great visit and NYC would make a great setting for a story. Just saying! I love that your son wanted to see The Phantom of the Opera at age 5!! I hope he gets to see the Opera House on his travels. It may be on his list, Darlene. He’s not your typical 18-year-old. 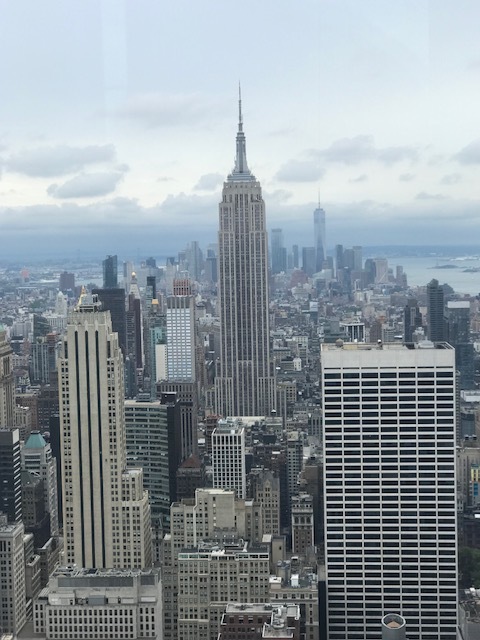 NYC would make a great setting – and I’ve already done the research! Looks like you had a busy yet so exciting weekend! I love that you experienced this with your son. I hope to do the same some day, hopefully NYC @ Christmastime. I love this post and all your pics! Thanks for sharing this and glad you had a great time. So much fun, Mischenko, but my feet may never be the same! Christmas in NY is gorgeous – I was there around that time roughly 22 years ago. You’ll love it. A fabulous weekend, Tiana. Have a great week! What a wonderful trip, Teri. Lucky you. Quick and busy, but we packed in a lot, Robbie. Fantastic. I’ve done several foodie tours in NYC. My favorite was the meat packing district one through the old Nabisco factory. What fun! I could have eaten my way through the Nabisco factory.